Radiology is ideally placed to benefit from artificial intelligence (AI). There is huge potential healthcare benefit, however patient acceptance of AI is unknown. The technology can be difficult to understand and trusting an AI system with life-or-death decisions may be unacceptable for some. A total of 30 patients, who had been scanned or x-rayed in the past, were surveyed. All data was collected anonymously. 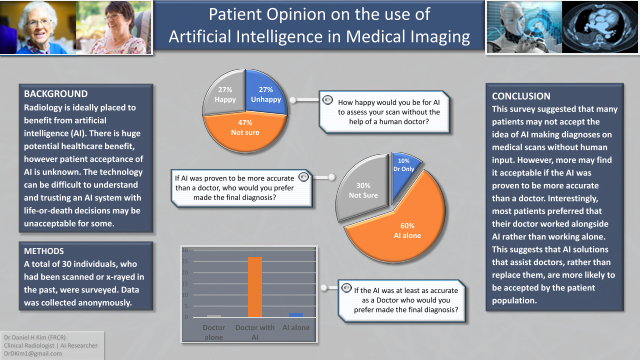 When asked how happy they would be for an AI computer programme to assess their medical scans without the help of a human doctor, 27% of respondents were happy or very happy, 27% were unhappy or very unhappy and 47% were unsure. The majority (90%) preferred the diagnosis to be made by a ‘doctor, with the help of AI’, compared with ‘doctor alone’ (3%) or ‘AI alone’ (7%). Finally, if the AI computer programme was proven to be more accurate than a human doctor, 60% would prefer the diagnosis to be made by AI, compared with a doctor (10%); although 30% remained ‘unsure’. This study suggested that many patients may not accept the idea of AI making diagnoses on medical scans without human input. However, more may find it acceptable if the AI was proven to be more accurate than a doctor. Interestingly, most patients preferred that their doctor worked alongside AI rather than working alone. This suggests that AI solutions that assist doctors, rather than replace them, are more likely to be accepted.